Sisters Tessa and Lainey Garcia weren't on speaking terms. But now that Tessa's dead, her wisecracking ghost is making up for lost time. Lainey Garcia left Texas nine years ago after her sister Tessa married the only man Lainey ever loved. So when Tessa's house explodes, the last thing anyone expects is for her to appear to Lainey . . . as a ghost. Formerly a part owner of the biggest vineyard in the region, Tessa's got the goods on every fake, floozy, and two-faced liar in town. But Tessa doesn't know who killed her, and she asks the remaining Garcia girls to uncover the truth. Setting out to fulfill their sassy sibling's wish from beyond the grave, the sisters discover a mile-wide list of suspects who wanted Tessa dead. Learning the hard way that killers don't like snoops, Lainey fears she'll be the next Garcia sent to the big vineyard in the sky. 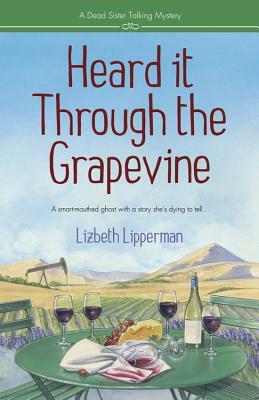 Lizbeth Lipperman (Dallas, TX) is the author of the Clueless Cook mystery series (Berkley Prime Crime). She worked as a registered nurse before becoming a writer.